Integral window blinds are perfect for controlling room temperature, maintaining privacy, protecting your furniture from fading and adding a stylish finishing touch to any room. Morley’s integral blind system eliminates the need for cleaning, and gives you a wide selection of contemporary blinds that will never get damaged. These systems are specifically designed to fit within double (or even triple) glazed units for windows, roofs or doors and are available in a wide range of designs, colours and functionality. 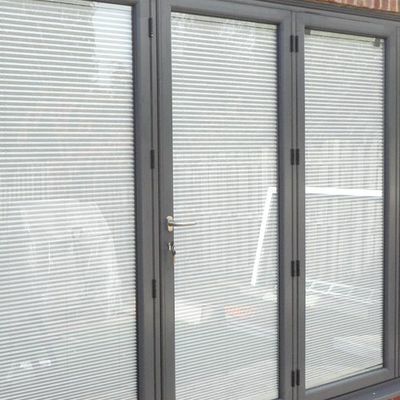 Venetian and Pleated blinds are suitable for all vertical window applications, ideal for conservatory shading, are the only viable option for bi-fold doors, offer total privacy and light control for door systems, provides excellent utilisation for partitioned office space and can be fitted into existing frames. C System is a patented magnetic system with manual operation (raising and tilting function) for Venetian blinds incorporated within 20mm – 22mm cavity insulating glass units. The external magnet, fixed to the internal glass by double-sided high performance adhesive, allows perfect alignment with the internal magnet. Raising and lowering is controlled using a continuous cord loop that drives the external magnet. The cord is held lightly under tension by a cord tensioner and fully complies with the British Blind and Shutter Association – ‘Make it safe’ campaign. The system is supplied with warm edge spacer bars as standard. ScreenLine® SL20SV is a manually-operated patented magnetic system with raising and tilting function for Venetian blinds encapsulated within 20mm cavity double glazing units. SL20SV is operated by a magnetic slider, placed on the right or left-hand edge of the glass. A narrow adhesive transparent profile ensures the linear movement of the slider. The blind is raised and lowered by moving the slider up or down and is tilted by slightly lifting or lowering the same slider. SL20SV is suited to all types of window frames. The integrated unit is as straight forward to fit as a standard IGUs. The system is supplied with warm edge spacer bar as standard. The ScreenLine® SL20-22S is a manual system comprising a 14mm pleated blind integrated within a double glazed unit with 20mm or 22mm cavity. The blind movement is achieved by a magnetic device positioned centrally on the outer surface of the internal pane sliding across the glass surface. This external magnet interfaces with a similar internal magnet located in the movable headrail to absorb possible glass defects. The blind can be adjusted at any inclination and raised in all directions, making it an ideal system for attic, dormer and skylight applications. Manufactured using high quality materials, this technically excellent system looks great whilst operating to the highest standard. The electric brushless motor quietly raises, lowers and tilts the integral blinds safely, smoothly and with precision. This system is ideal for exclusive domestic properties encapsulated within 20, 22 and 27mm cavity double glazed units. The motorised Venetian or pleated blind has an internal motor integrated within the blind head-rail and incorporates a micro-control unit plus encoder, which allows simultaneous, synchronised movements of groups of blinds. The latest in innovative and ecological Italian design, the W Swipe is a battery operated, motorised blind system utilising Venetian or pleated blinds, encapsulated within a 20, 22 or 27mm cavity double glazed unit. 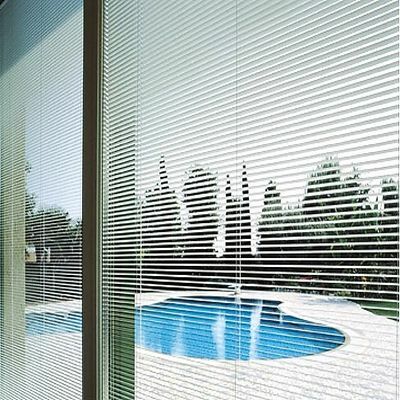 The encapsulated blind is raised and lowered, and in the case of the Venetian blind, slat-tilted via a discreet slide button control which is magnetically attached to the double glazed unit.